Well, friends, it’s official. Homesteading, rural or urban, is a movement. It is growing faster then my bean vines. If I ever thought I had a new idea in my head, I do not now. And it is the kids, young couples with children, single 20-somethings wanting to find a better way of living, and a few holdouts from the counterculture generation, who are doing it for real. And no doubt are working hard. I mean real hard. Reading the tons of blogs and websites from countless numbers of folks both in and out of this country is awe-inspiring. But then I’m still a city girl and will no doubt always be a city girl. I admit to liking to sashaying up to the coffee shop to read the paper and visit with friends. I like going downtown to enjoy lunch or the museum. I like the energy, the efforts, and the culture of the city. So urban homesteading turns out to be a happy middle ground for me. 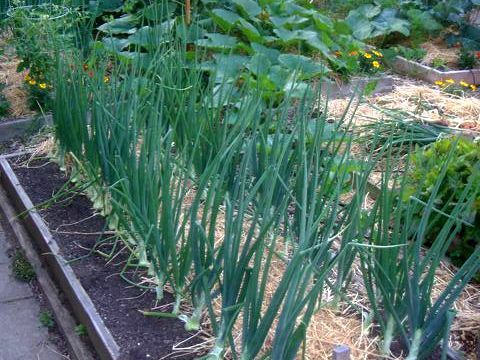 [%image reference-image float=left width=400 caption="Onions in the garden."] If I were a younger woman I might head out. I would look for a piece of land that ran next to neighbors and a community of like-minded folks with a college or university nearby. My husband talks about Ithaca, New York, but that’s only because we've both got some Currier and Ives image of East Coast winters by the fireplace. He should know better, because we both grew up back east and remember what shoveling snow is really about. Yeah, there’s some hot chocolate waiting for you, but, as a kid, not much else by way of value. Still, we talk about it. We talk about retiring (yep, that conversation) to an eco-village where we can ripen gracefully as “enlightened elders,” but then everyone at an eco-village is somewhat enlightened (or imagines they are), which would make us less special than we think we are. We could go to the countryside in France or Italy or Costa Rica and learn the native language and dotter into the local town with our berets or straw hats and look at all the children playing in the town square, but I’m assuming that by then we will hate to hear kids making noise and will prefer an adult eco-village (not to be confused with a swingers eco-village), and leave the charm of children to those who still have the nerves for it. We should just grow old with these plantings and land and wear a groove into the floorboards of this house and learn what it means to stay put long enough to experience the truest sense of homesteading: staying in place and tending it throughout one’s life. And so, in case you were worrying, I think we will stay here in Portland and don our berets and make it up to Alberta Street to tell whomever will listen all about the glory days (wait, we already do that) and learn to live fully in the community we are already growing old with. Hopefully, together, we will make this city a righteous piece of heaven and a nurturing world for the noisy kids down the block.